How are you managing news, alerts & emergency notifications on your campus? If you have multiple vendors and systems for clocks, digital signage, severe weather alerts, fire alarms or lockdown notifications, then you’re spending a lot of time and money managing that complexity. What’s more, most of the systems may not communicate with each other, leaving you with an unconnected network that can’t meet your daily needs – or during a time of emergency. EverAlert provides a single platform and user interface for communicating emergency alerts, routine digital signage and synchronized time. 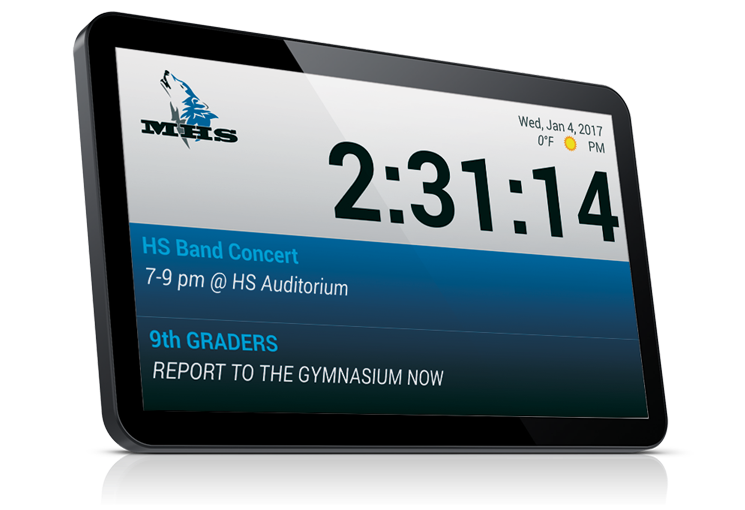 It includes visual displays that bolster and extend your existing messaging and emergency notification capabilities. Watch the Recording of our latest webinar from January 23. Keep critical communications clear and timely during threats. Improve communication and tailor messages by audience. The fact that EverAlert can serve multiple functions really impressed me, from displaying news and lunch menus to alerts and emergency information...it's really unlimited. Interested in learning more about EverAlert? Considering an emergency alert system for your campus? We invite you to fill out the form with your questions/comments, and we will be sure to get back to you.